Our greatest goal is to give you the functional, beautiful smile that you've always wanted. We understand that choosing to receive orthodontic care is a big decision, and we respect your reasons for wanting to improve the way you look and feel. Our practice will work with you every step of the way to make sure that your orthodontic care is as rewarding as possible. Our practice utilizes the latest technology, offering a variety of safe and gentle treatment options to give you the customized, individual care you deserve. 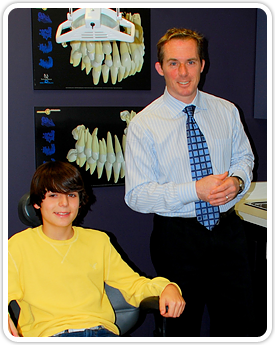 All orthodontic treatment starts with an initial consultation! Provide a complete oral exam to determine whether treatment is necessary at this time. This involves Dr. Clarke looking with a dental mouth mirror and providing you verbal and written feedback on this. The next step toward treatment will involve the creation of orthodontic records.These diagnostic records include plaster models of your teeth, digital x-rays of the head and teeth, and digital photographs. The photographs show facial musculature and balance as well as the dental malocclusion. The models allow the orthodontist to make measurements and further diagnose the case. The panoramic radiograph shows the teeth, roots, bone levels, and jaw formation, while the cephalometric radiograph shows the jaw positions, teeth angulations, and soft tissue profile. Doing this also provides a record of pre-treatment status. A definitive treatment plan is formulated from the clinical findings of the initial exam and the analysis of the orthodontic records and this will be discussed with you during the case presentation appointment. Visiting the orthodontist for short appointments every four to eight weeks is an important part of your orthodontic treatment. Our practice will work with you to make sure that your appointments are convenient and efficient. When scheduling appointments, please let us know what days and times work best for you. It is very important that you continue to visit your family dentist once every six months, even during your orthodontic treatment, for professional teeth cleanings and routine dental checkups. If extra dental care is needed, we will be happy to coordinate with your family dentist to make sure that you are receiving the best care possible.